Captions: Medical staff, patients, Friends of Yoga members, yoga long-term enthusiasts and amateurs alike take part in the ‘Happiness with Yoga’ session at Zulekha Hospital in Sharjah. Dozens of nurses, doctors, admin officers and their families took part in a new ‘Happiness with Yoga’ session organised by Zulekha Hospital as part of their commitment to boosting their staff health and the wellbeing of the UAE community. 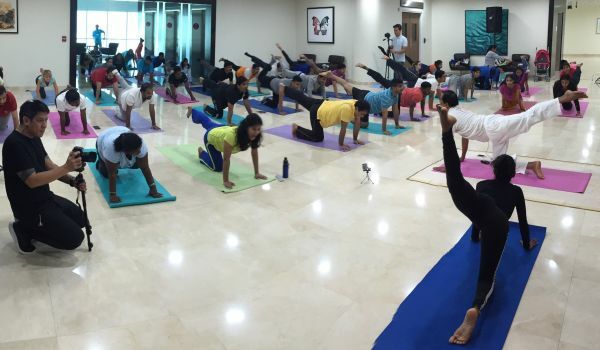 Leading up to the celebrations of International Yoga Day (21 June), the ‘Happiness with Yoga’ session was delivered by Augustine Joseph, a well-known yoga instructor, awarded with the Certificate of Honour from the Institute of Naturopathy and Yogic Sciences in Bangalore, India for his outstanding contribution in promoting yoga. As a long-standing member of Friends of Yoga, Augustine shared his knowledge and passion for the practice alongside Afreen Khan, Marketing Executive at Zulekha Hospital and a yoga enthusiast. Together, they demonstrated to the hospital staff, their partners and families twelve easy sun salutation poses, and practiced laughing, clapping, and meditation techniques that can be done at a workplace to help improve concentration while decreasing stress levels. Ms Zanubia Shams, Co-Chairperson of Zulekha Hospitals, took part in the session alongside colleagues at the Sharjah facility. She said: “It was a great session and it was heart-warming to see our staff taking part in this body and mind event with so much enthusiasm. Celebrated globally, International Yoga Day was originally proposed in India with support from 175 United Nations member states before becoming officially established by United Nations General Assembly (UNGA) in 2014. It has been observed in the UAE since, and numerous official organisations, such as the Indian Consulate at the Dubai World Trade Centre will hold yoga sessions this year. Zulekha Hospital has received multiple awards for their health awareness initiatives aimed at improving the lifestyle, wellbeing, and the environment of the UAE community. From organising blood donation drives, sustainability-themed initiatives, to cancer awareness campaigns, the hospital has developed a versatile plan for inspiring wellness and happiness. Aligned to its “Your Health Matters” approach, Zulekha Hospital is currently running a ‘Smear, Don't Fear’ Cervical Cancer Awareness Campaign, offering free specialist consultations and Pap tests until June 30. To book an appointment, patients should call 600 52 442.